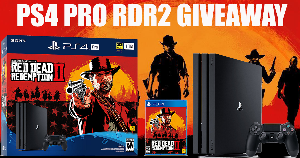 Prize: PlayStation 4 Pro 1TB Console - Red Dead Redemption 2 Bundle. Bundle includes a copy of Red Dead Redemption 2 on Blu-ray Disc , a Jet Black PS4 Pro 1TB console , and a DUALSHOCK 4 wireless controller. What you must do to enter: Enter via Gleam. Statistics: This contest was opened by 168 and entered by 23 ContestChest.com members. 14% of those who opened the contest, entered it.